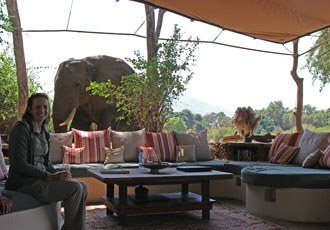 Mchenja is a luxurious, elegant and stylish tented camp overlooking a huge sweeping bend in the Luangwa River. The wide windows of the five specially designed octagonal tented chalets frame the far-reaching views. Each has their own private en suite open air bathroom plus Victorian style baths looking out over the river. There is a small pool in camp. Mchenja is the perfect destination to complete your walking safari offering as it does, superb game viewing combined with a little extra comfort. Situated on the confluence of the Chongwe and Zambezi Rivers, Chongwe River Camp offers superb wildlife viewing and a range of activities including canoe and jeep safaris, fishing and nature walks.The camp consists of nine comfy, en suite safari tents, a small pool and an outdoor dining area where you may even be joined for dinner by one of the local elephants! Chongwe also offers a romantic honeymoon suite and private family suite - each with its own plunge pool and personal butler. 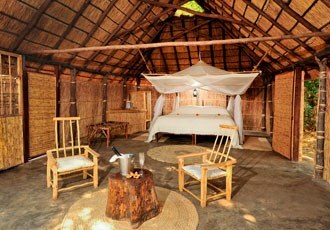 Described as ‘the best little bush camp in Africa’ Luwi is an authentic, remote and magical bush camp. 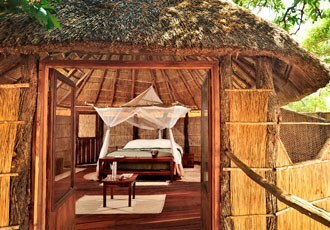 The rooms, which are built each season using grass, bamboo and thatch and are simple yet extremely comfortable with en suite bathrooms and hot showers. With the emphasis on the use of natural materials in its construction, this camp is one of the most traditional of all of the Luangwa safari camps but still offers high levels of comfort and service. Daytime meals are served in the shade of the mahogany trees. There is a large hippo filled lagoon close by with a ‘hide’ for guests to watch the animals unnoticed high above the water. This permanent water source attracts wildlife from far and wide making the camp area constantly busy with animals. Perfect for walking safaris. 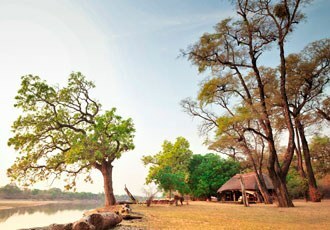 The height of luxury, Chinzombo camp is one of the most indulgent properties in the Luangwa Valley. Set in 60 acres of private land on the Luangwa River, the camp comprises six ultra-stylish villas each with its own plunge pool, cooled sleeping area and spacious bathroom. Fine dining and exemplary service are experienced in the beautifully designed dining area whilst a lounge area, fire-pit and in-room spa treatments add to the sense of elegant relaxation. 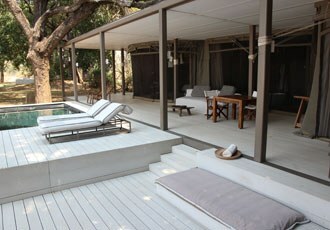 Situated on the edge of the national park this is a superb location for exclusive walking and driving safaris. This is one of the South Luangwa's more remote, luxury bush camps with a wonderful dry river bed location in front of an active game lagoon. The five spacious chalets have grass and reed walls, large open-air en suite bathrooms and raised wooden decks. On the banks of the Luwi River is an open sided, shady chitenje lounge with a bush bar and dining area offering a peaceful refuge where you can browse the collection of books or watch a variety of game visiting the permanent pools of water in the Luwi riverbed. Browse some of our favourite experiences in Zambia, and add any that take your fancy to your wish list. Close to Victoria Falls in Livingstone, Toka Leya makes a delightful base for visiting the falls and for enjoying the abundant wildlife of the area. Situated on the banks of the Zambesi River the camp has 12 spacious en suite safari tents together with dining, lounge and bar tents. There's even an infinity pool for an extra touch of style. Numerous activities can be enjoyed from the secluded environs of Toka Leya including game drives, river cruises and rhino tracking, alternatively just relax on the generous sundecks and watch the wildlife go by.